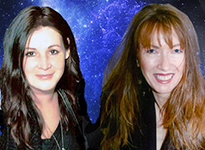 Venus moves into light-hearted free-spirited Gemini today, the sign of its esoteric rulership. Venus in Gemini understands the importance of sharing ideas and communicating feelings, which are the foundations upon which happy, healthy relationships are built. But it also relates to the mental aspects of relating via decisions that need to be made. Sometimes — where the Lovers card is concerned — it’s a choice between two people, and sometimes it’s a choice between love and something else (career, family, responsibilities, freedom. etc.). 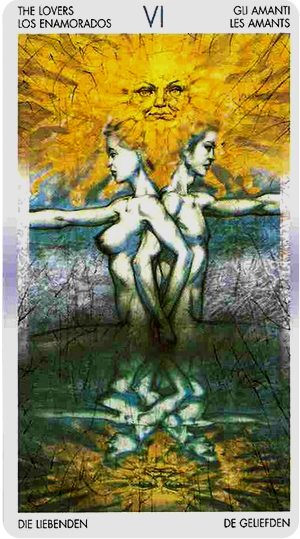 The Gemini duality is present in this version of the card. The yin / yang energy is evident in the most literal sense (the figures are male and female) but also figuratively in that one faces left (referencing intellect) and one face right (referencing feelings). Also notice that while they are holding hands, they’re both also reaching out for something (or someone) just beyond our view. They stand waist deep in a pool of water (emotions, the unconscious) while the Sun shines down on them so brightly that it’s nearly impossible to tell where it ends and they begin. While the Lovers card does relate to merging with another and forming deep emotional bonds, there are always undercurrents of something else — something that must be factored in, decided or sacrificed — that need to be addressed. Look at how their images are distorted on the surface of the water. The clean lines of their bodies and the glare of the Sunlight have all been softened in the reflection. This is something you might think about when making your own decisions or forming your own conclusions about the people in your life. A little less scrutiny (harsh glaring sunlight) and a little more fluidity (to counter the fluctuating emotions that are a natural part of every relationship) can go a long ways toward healing any riffs that occur. no you are not seeing double (well on second thought, maybe you are). In the spirit of a true Mercury retrograde and Venus in Gemini transit, we BOTH inadvertently wrote a scope for this card — and have decided to publish them both! Take your pick!